No matter the country, language, religion or traditions, lots of people have something in common: they all feel citizens of the world. ‘Borders’ are first of all in our minds. When I think of “Beyond Borders” I imagine travel experiences when we are able to pass through the borders of language, culture, and nationality and experience a genuine slice of life in another country. Such experiences are a goal of travel for most people but can be difficult to experience unless one spends a significant amount of time in the destination or with people who live there. I had such an experience last summer while in Brazil. My husband is from São Paulo, and we spend a month or more there every summer visiting his family. One of my sisters-in-law treated me to an afternoon Saturday Samba. I had no idea how much I would enjoy it, and by the end, I had realized that it was one of my all-time favourite travel experiences! I think every traveler to Brazil should do it – you can find live samba restaurants any day of the week and in any city in Brazil. It’s most common for Brazilians to enjoy these as a long evening on the weekends. We went to the old, artsy neighborhood of Vila Madalena and headed for Bar Samba, an old house that has been converted to a restaurant. 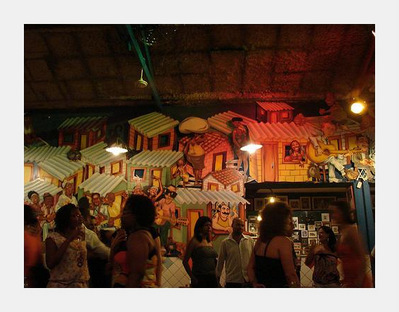 It’s known as the best samba restaurant in São Paulo, and its walls are filled with caricature paintings of famous Brazilian musicians. We arrived “early” for lunch, at 1:00 when they opened, so we watched the band set up just a few feet away from our small wooden table. We ordered drinks: caipirinhas (the typical Brazilian drink of cachaça, lime, and sugar), caipirovskas (a caipirinha but with vodka) made with all kinds of fruit, like strawberries or limes. In typical Brazilian fashion, fresh juices were also available. Then the food came—the best feijoada I have ever had. Feijoada is the typical Brazilian feast consisting of small steaks, black beans stewed with pork (including the fantastic dried pork so often used in Brazilian cuisine), rice, kale, farofa (ground manioc), and oranges. I usually don’t eat meat but tried the beans with pork, and it was delicious! While we were eating our great lunch, the band began to play. The music was incredible – live samba is powerful, with several men singing at the same time, and with lots and lots of drums. 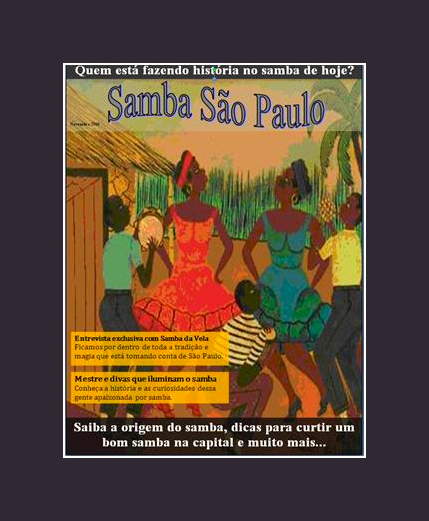 The infectious rhythm of samba filled the room, and people sang along and began dancing. Some requested songs and interacted with the musicians. Soon we were dancing, too, and the place began to fill with more and more people. It became completely packed as the afternoon turned to evening. Everyone was smiling, talking, dancing, singing, and sharing in the common experience of the music. I was participating in a perfect example of how Brazilians let loose on the weekends – with family, with friends, and with strangers, sharing in a few hours of complete joy with music, dance, food, and drink. 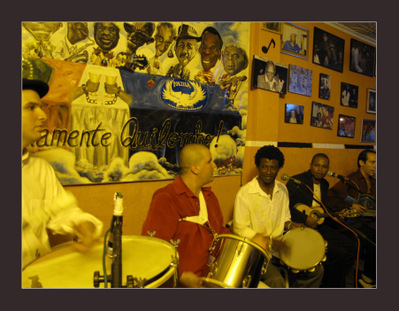 It typifies what is so intriguing about Brazilians – their zest for life and their passion for rhythm. 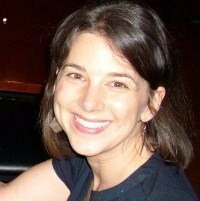 Jenna lives in Sacramento, California, but loves to get away whenever she can. She studied and lived abroad and has traveled extensively through Europe. She has a multi-cultural family and visits family every year in Brazil or Indonesia. As the mother of a toddler, she is learning new ways to travel. She enjoys sharing her adventures and connecting with other travelers on her blog This Is My Happiness and her Examiner.com page. True, Brazil is a wonderful country and I’d love to come back! I really enjoyed this piece! It really was a window into another culture, and an experience the average traveler might miss. Thanks! Yes, Jenna wrote a wonderful guest post, sharing what must have an awesome experience. Discovering a country and its traditions with locals makes everything very special and often leads to unexpected but lovely experiences. What fun! Definitely something I’d enjoy. The more I hear about Brazil, the more I fall in love with the idea of it. Brazil is really awesome, I’m sure you’d love it!